Christmas celebrations started last night with Pope Benedict XVI holding a midnight mass service at a packed St. Peter’s Basilica in the Vatican. Pope Benedict XVI used the ceremony to condemn the “superficial glitter” that now imbues the holiday. The Pontiff, 84, urged the faithful to discover its true meaning and remember the “child in the stable” instead of being consumed by the commercial side of Christmas. The Vatican traditional service began with a papal procession through the church shortly after 10:00 p.m. local time. Wearing cream and gold colored vestments, Pope Benedict XVI proceeded into St. Peter’s Basilica standing on a moving platform – a new concession to spare the pontiff the fatigue of having to walk up and down the long center aisle. In his sermon, Pope Benedict lamented that Christmas has become an increasingly commercial celebration that obscures the simplicity of the message of Christ’s birth. “Let us ask the Lord to help us see through the superficial glitter of this season, and to discover behind it the child in the stable in Bethlehem, so as to find true joy and true light,” Pope Benedict XVI said. It was the second time in as many days that the Pontiff has pointed to the need to rediscover faith to confront the problems facing the world today. In his end-of-year meeting with Vatican officials on Thursday, Pope Benedict said Europe’s financial crisis was largely “based on the ethical crisis looming over the Old Continent”. The Christmas Eve mass was moved up to 10:00 p.m. from midnight several years ago to spare the Pope a late night. This morning he must deliver the important Christmas Day “Urbi et Orbi” speech (Latin for “to the city and the world). He will also offer brief Christmas greetings in 65 languages. The Pope speech, delivered from the central loggia of St. Peter’s overlooking the piazza, is usually a survey of sorts of the hardships and wars confronting the globe. It is understood that this year he will base his message on the Arab Spring and the global economic crisis. There follows an intense two weeks of Christmas-related public appearances that will test the Pontiff’s stamina amid signs that fatigue is starting to slow him down. Hours before the evening Mass began, Pope Benedict lit a candle in his studio window overlooking St. Peter’s Square in a traditional sign of peace. A few hundred people had gathered in the square to watch the candle lighting and the unveiling of the Vatican’s larger-than-life nativity scene. 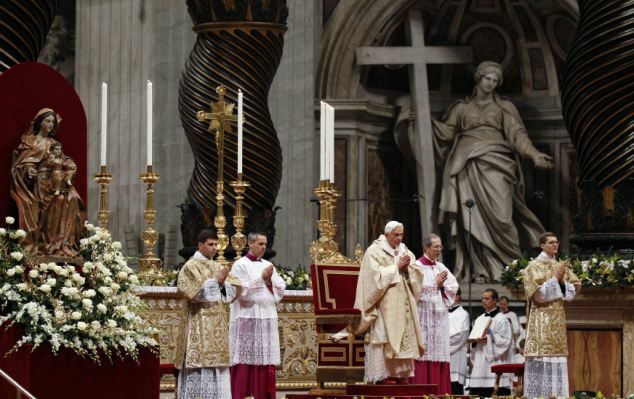 Next weekend, Pope Benedict XVI will preside over a New Year’s Eve vespers service, followed by a New Year’s Day Mass. A few days later he’ll celebrate Epiphany Mass followed by his traditional baptizing of babies in the Vatican’s frescoed Sistine Chapel. Security was tight at last night’s celebration, as it has been in recent years. In both 2008 and 2009 there were Christmas Eve security breaches, in which a woman with a history of psychiatric problems and wearing a telltale red sweatshirt jumped the wooden security barrier along the basilica’s central aisle. In 2008, the Pope’s security detail blocked her from getting to Benedict. But in 2009, she managed to grab Benedict’s vestments and pulled him to the ground. The Pope was unhurt and continued along with the service, but a French cardinal who was nearby fell and broke his hip.